The devices will track traffic, light, air quality, and temperatures. The data will be made available to the public. Chicago will install 50 location-based sensor devices around the city this July and August, and 450 more by the end of 2018. 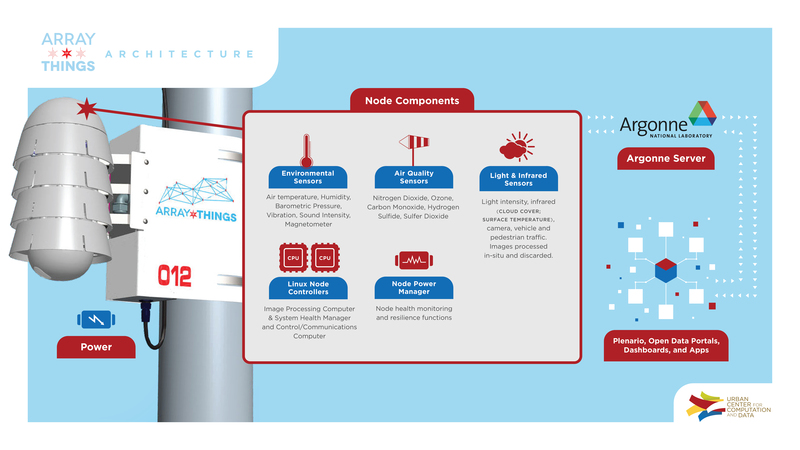 The Chicago Tribune reports that the project, named the Array of Things, will track temperature, air quality, light, and traffic data in an effort to improve city life conditions. Sensors will be installed into streetlight traffic signal poles in both the downtown Loop and an undecided neighborhood. The devices will be concentrated in areas that need further specific problems, like air quality and fluctuating temperatures, examined. The project, a collaboration between University of Chicago, Argonne National Laboratory and the School of the Art Institute of Chicago, received a $3.1 million grant from the National Science Foundation in September last year. Data from the project will be released to the public via Chicago's Open Data platform a few months after the first sensors are installed. All software, hardware, parts, and specifications will be published as open source. The Array of Things website says that the technology will serve as a “fitness tracker” for Chicago, allowing residents to monitor exposure to air pollutants and find the least congested travel routes. “The data will help make Chicago a truly ‘smart city,’ allowing the City to operate more efficiently and realize cost savings by anticipating and proactively addressing potential problems like urban flooding,” the website says. Amid privacy concerns, the Array of Things says it will not collect any personal or private user information.